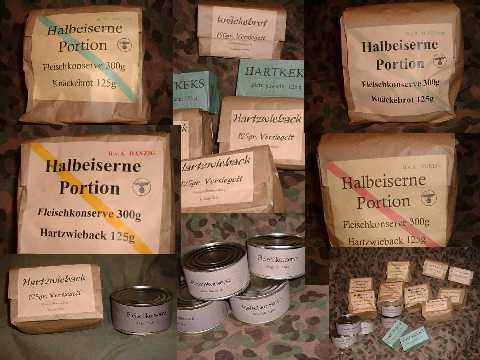 This is the Wehrmacht's standard iron ration carried by every soldier in peace time and in war. This packet contains one tin of Meat, could be Schmalzfleisch -- similar to Spam -- or other meats, such as Roast Beef in Gravy (Rinderbraten) or Turkey with Gravy (Truthahnbraten). Sorry, just as the Landser, you get no choice. If you order several packs, you can either choose a mix of outer packs, or all the same (in case you want your unit to be issued alike), however. Please specify! YES! THIS IS THE ITEM THAT GOES INTO YOUR 7"X6" EISERNE PORTION BAG LIKE THE ONE YOU BOUGHT FROM 1944 MILITARIA! 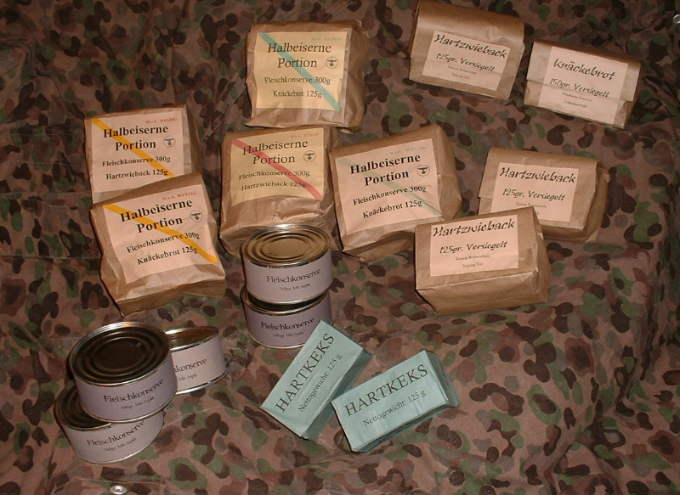 100 or more (Feed the Wehrmacht) $6.50 per pack! PLEASE...DO allow an extra two weeks; don't invade anyplace without giving us prior warning!